Bill Sharpes Financial Engines might be called the first robo-advisor. Bill Sharpe’s Financial Engines might be called the first robo-advisor. When he co-founded the firm in 1996, he had already won the Nobel Prize in Economic Sciences. Two years later, the firm launched what the firm calls the “first independent online advice platform,” which uses Monte-Carlo-based planning to help consumers plan for retirement. Financial Engines has found a lucrative role in retirement planning, providing technology-enabled retirement help to more than 9 million employees at more than 600 companies, partnering with major retirement plan companies like Vanguard and Fidelity. 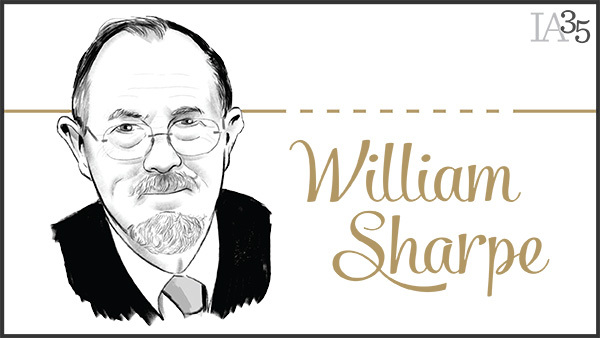 Then there’s the Sharpe ratio, which Sharpe first described in 1966 to measure risk and reward, and is still a popular measure of a fund’s volatility. Though retired from Financial Engines, Sharpe still serves as Director Emeritus on the firm’s Board of Directors. He’s the STANCO 25 Professor of Finance Emeritus at Stanford University’s Graduate School of Business. He’s written several books, and is working on another book project on retirement income. In fact, he declined to be interviewed in order to focus on that project. In an interview at the CFA Institute Annual Conference in May 2014 , Sharpe said empirical work was critical to an academic understanding of the markets. “Part of the problem with empirical work, and the need to do empirical work, is in a market where everybody’s trying to make a buck and beat the other guys, if something in retrospect would have beaten the other guys–now especially with big data, people are trying to find something that would have worked and now when people find it, they exploit it—[but] as I wrote a million years ago somewhere, a successful system to ‘beat the market’ carries the seeds of its own destruction,” Sharpe said. Sharpe said we ignore research on behavioral finance “at our peril,” and said he was worried about using old assumptions about people’s utility functions to predict how they would behave in retirement.